A ringing was ringing in my mind. My spirit and life are ringing sounds - Too cramped for them are earthly bounds! 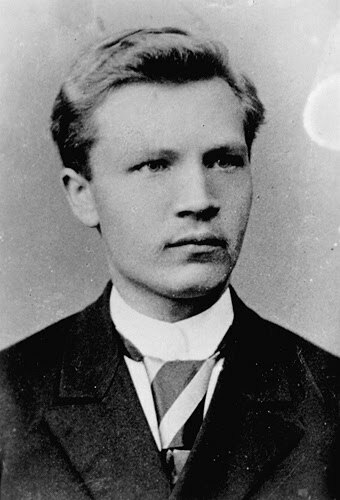 Estonian poet Juhan Liiv was born in this date in 1864, in the village of Alatskivi. He struggled with mental illness as a young man, and had trouble holding a job. His first story, "The Shadow," was published when he was thirty, and remains a classic of Estonian literature. But by the time it was published, he was staying at a clinic in Tartu, and was diagnosed with schizophrenia. A literary editor found his work and a volume of almost 500 poems by Liiv was published in 1909. Some of this poetry reflects Liiv's feelings of doom and fear, and his experiences as a poor and misunderstood man; other pages contain romantic or patriotic verses that found an appreciative audience. Liiv died from pneumonia in winter 1913, after being thrown off a train (he didn't have a ticket, and unfortunately he didn't take his coat when he was ejected in a remote area). Today, Liiv is considered one of the finest poets in Estonian literature. His grave in his home village has a handsome marker, and the farm where he was raised is now a museum. Some of his writings have been set to music. Alatskivi also offers an annual Juhan Liiv Prize for Poetry. Disability Blog Carnival #65 is up NOW! Story is the stuff of relationship. Story makes information meaningful and 'random' anecdotes connect. The story society tells itself about disability--that disability is suffering and tragedy--often upstages the stories that people with disabilities live every day and tell whenever they get the opportunity. Yes, it's that time of year again.... BADD 2010! Click the logo above for more information, then sign up to participate. BADD is now in its fifth year, which you know qualifies as "longstanding" in blog time. Disability Blog Carnival #65 will be hosted at Twxee's blog, River of Jordan, next week. I'm come to know that there haven't been a lot of submissions so far, so please consider sending Twxee some links this weekend, especially for recent posts on the subject of "Balance" (her chosen theme). Or leave links here in the comments area.